Washers provide a smooth bearing surface and are used under the head of a bolt and / or a nut. 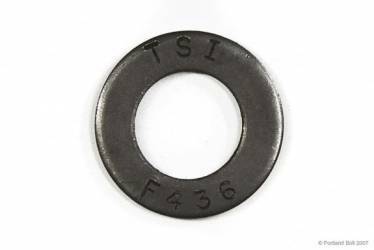 The chemical, mechanical, and dimensional requirements for hardened washers are covered under the ASTM specification F436. 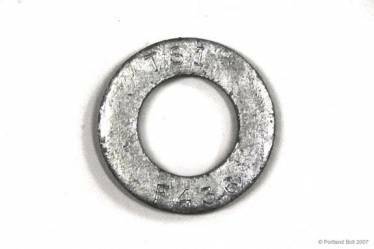 These washers are through hardened or carburized to add strength, but are physically smaller than a standard F844 flat washer. They are the recommended washer for any fastener other than a low carbon steel bolt. Portland Bolt has the ability to manufacture or provide nonstandard square, rectangular, or round washers meeting the requirements of ASTM A36, A572 Grade 50, or F436. *F436 defines dimensions for extra thick washers up to 4” diameter, but sizes larger than 1-1/2” often need to be custom manufactured. *Some extra thick washers available in the marketplace are not made to these dimensions. Care should be taken to specify 5/16” thick washers when 5/16” thick washers are required per AISC. Also available in the marketplace are large OD hardened washers, in both standard thickness and extra thick pattern. These washers are made with the same OD as F844 washers, but the same hardness as F436 washers. 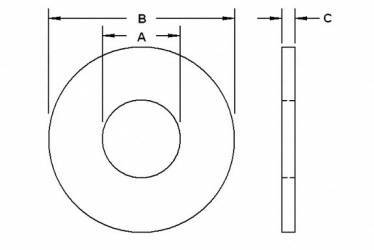 Washers with these dimensions are not specifically covered by F436, but they are available and can be used when larger OD hardened washers are needed.